CES uses 15 ranking factors divided into 6 types to calculate the relevance score of documents. CES natively uses pre-tuned ranking weights that are likely to be satisfying most of the time. Nevertheless, fine-tuning these factors can sometimes increase accuracy, especially for specific situations. Example: An organization may find not important that a recent document modification date contribute to a higher rank. As a Coveo administrator, you can fine-tune the ranking of search results by adjusting the weight of each ranking factor and specify ignored fields, fields whose values are not taken into consideration when ranking results. By default, each of these factors is assigned a weight of 5 on a scale of 1 to 9, where 9 corresponds to the highest ranking weight. In the Administration Tool, select Index > Ranking. In the navigation panel on the left, select Ranking Weights. Select a higher value to increase the importance of a factor. Select a lower value to decrease the importance of a factor. Select Ignore to exclude a ranking factor from the ranking process. Note: Even if all factors have the same weight (ex. : 5), their relative importance is not necessarily identical as CES uses a built-in weight for each factor. For example, Term in title has more effect on the final ranking than Document modified recently. Each ranking factor value is relative to the other factor weights. The resulting ranking is the same whether all multipliers are set to 4 or if they are all set to 2. You can give a higher weight to a factor by setting it to 7 and all others to, for example, 2. The relative weight of 7 against 2 is much higher than 7 against 4. Refer to the table that follows for details on each ranking factors. Higher relevance score to documents in which query terms are frequently repeated. The importance increases proportionally to the number of times a query term appears in a document relative to the number of times it appears in the index. Example: A document in which a term is repeated 10 times receives a higher ranking than one of the same size in which it is repeated only 2 times. The frequency factor has a higher ranking impact when searching for a term such as suspicious that probably occurs rarely in an index, compared to a term such as the that most likely occurs a large number of times in the index. Term proximity Higher relevance score to documents in which query terms are close to each other. This factor applies only when the query contains more than one term. Example: A document in which the terms are only one word apart receives a higher ranking than one in which they are ten words apart. Term in title Higher relevance score to documents containing query terms in their titles. Moreover, relevance is dependent on the proportion of title terms matching the query. Example: If the query term is Coveo, a document with the title Coveo Enterprise Search (one out of three words matches the query) receives a higher ranking than one with the title Enterprise Search, or Coveo Enterprise Search Provides Businesses with the Most Collaborative and Agile Search Solution Available (one out of 14 words matches the query). Term in concepts Higher relevance score to documents containing query terms in their lists of concepts. Concepts are extracted by the CES linguistic algorithm which relies on term frequency and proximity. Example: If the query is Coveo, a document for which the concept Coveo has been extracted receives a higher ranking than one for which this concept has not been extracted (even if the word Coveo is present in its content). Term in summary Higher relevance score to documents containing query terms in their summaries. Summaries are extracted by the CES linguistic algorithm which relies on term frequency and proximity (see What Is a Summary?). Example: If the query term is Coveo, a document for which the key topic Coveo has been extracted in its summary receives a higher ranking than one for which it has not been extracted (even if the word Coveo is present in its content). Term correlation within stemming classes Higher relevance score to documents words with the same root as the query terms and that are often found co-occurring in indexed documents (see About Stemming). Example: If the query term is universal, a document containing the word universality receives a higher ranking than one containing university when universal and universality have a higher co-occurrence rate than universal and university in indexed documents. Higher relevance score to documents whose modification date is recent. Example: A document modified today receives a higher ranking than one modified a month ago. Higher relevance score to documents which are close to the root of a file system. Example: A document located in C:\Docs\ receives a higher ranking than one located in C:\Docs\Projects\Project\Planning\. Higher relevance score to documents in the same language as the search interface. Example: If the search interface is in English, a document written in English receives a higher ranking than one written in French. Higher relevance score to documents contained in a source rated Highest to Above Normal as you can individually set the rating of each source (see Adding a Source). Higher relevance score to documents whose paths contain query terms. Example: If the query term is Coveo, a document whose address is http://www.coveo.com/en/Support/Default.aspx receives a higher ranking than one whose address is http://support.microsoft.com/. Higher relevance score to documents containing query terms in large fonts or bold. Example: If the query term is Coveo, a document containing the word Coveo receives a higher ranking than one containing the word Coveo. Higher relevance score to documents containing the same casing as the query term. Example: If the query term is iPad, a document containing the word iPad receives a higher ranking than one containing the word Ipad. Higher relevance score to documents whose collaborative rating score is high (see What Is Collaborative Rating?) when users voice their personal appreciation of documents (see Rating a Search Result). Note: Collaborative rating must be enabled for this factor to apply but it is by default. Calculating collaborative ratings may require considerable CPU resources and can slow down CES. If this problem occurs, consider reducing the number of top documents to which it applies (ex. : 50), reducing the number of groups or simply disabling collaborative rating (see Configuring Collaborative Rating). Determines the importance that must be given to documents whose custom ranking weight has been set. 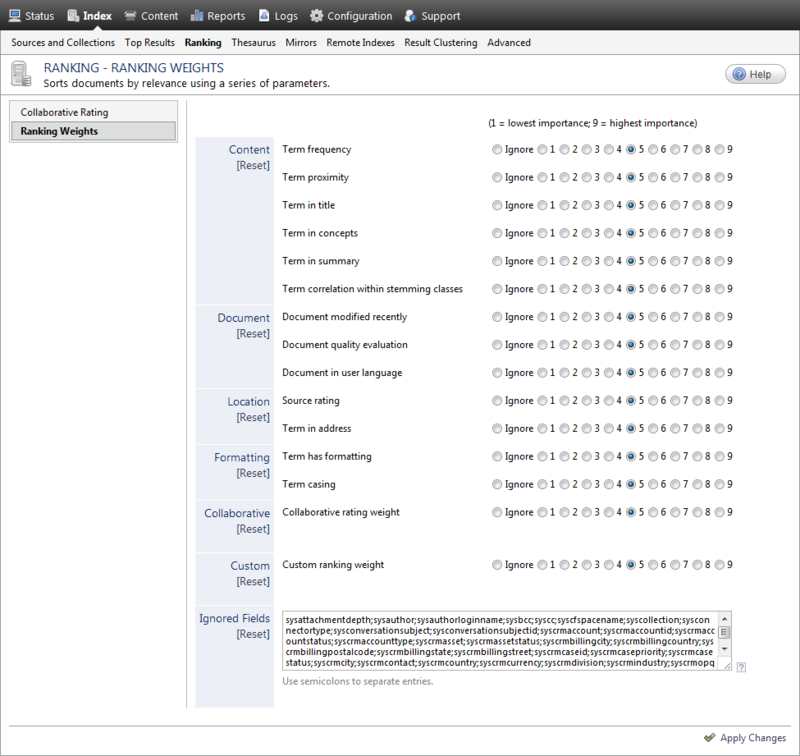 Custom ranking factors are scripted directly in open converters (see Administration Tool - Converters Menu and Adding a Connector). In the Ignored Fields box that already contains built-in fields that should be excluded, add the custom fields that you want to exclude from the ranking results (see What Is the Difference between Built-In and Custom Fields?). Example: If the query expression is Coveo AND @syslanguage=English, occurrences of the term English do not affect ranking because syslanguage is an ignored field. However, if syslanguage is removed from the Ignored Fields list, ranking is adversely affected because documents containing occurrences of the word English receive a higher ranking. Whereas, the purpose of syslanguage is to find documents written in English, not to display all documents with the word English in them. If custom fields can have a similar effect on ranking, add them to the Ignored Fields list. Click Reset below the label of a factor category, to return the weight of ranking factors for that category to their default value of 5. Click Apply Changes to save your modifications. Ensure your modifications improve search result relevance by looking at the detailed ranking information in your search interface(s) (Troubleshooting Ranking).